Kagoshima is located at the southern tip of Kyushu, the southernmost of the four main islands in Japan. It has a warm climate and vast area spanning 600 kilometers from north to south. Situated in close proximity to China and South Korea, it has developed a unique history and culture due to economic and cultural influences from East Asia, as well as from Europe via sea trade. Kagoshima has many attractive sights such as Yakushima, a UNESCO World Natural Heritage Site, the active volcanoes Sakurajima, Kirishimayama, and Suwanosejima. You will be able to enjoy and admire the remarkable natural sceneries as well as rich nature and hot springs. Kagoshima is one of the main food supplying regions of Japan, producing high quality agricultural and marine produce. It is also the only prefecture in Japan that has rocket launching facilities. With the Kyushu Shinkansen going into full operation since March 2011, Kagoshima became more accessible and the number of visitors and business people doubled. It now takes 4 hour 19 minutes to travel from the JR Shin-Osaka station in Kansai to Kagoshima Chuo station on “Sakura”, the new Shinkansen train. In addition, Kagoshima airport, the hub of southern Kyushu, has regular international flights from Taipei, Shanghai and Seoul, which are in turn connected to nine major Japanese cities such as Tokyo, Osaka, and Nagoya, as well as eight islands of Kagoshima prefecture, via domestic flight. Kagoshima City welcomes you with its wonderful grandiose view of Sakurajima, an active volcano, right in front of the city center. The former has grown into a major city in southern Kyushu with a population of approximately 606,000 people. The various city sights can be accessed via the street trams and sight-seeing buses. With magnificent scenery and delicious local food, the warm southern hospitality will make your stay and unforgettable one. The IAVCEI 2013 Scientific Assembly welcomes you to this charming city. Site A is completely closed on July 22. Taxi: The travel time will be 15 minutes. Tram: From Kagoshima Chuo Station alight at Shiyakusho-mae (the City Hall) stop, the 8th station, and walk to the center. The tram fare will be 160 yen for adults and the travel time is approximately 30 minutes. A 10-minute walk to the center. Airport Limousine Bus: Take the bus going to Kagoshima City via Yoshino, via Ishiki or via Kagoshima Chuo station. Alight at Kinsei-cho for the bus via Yoshino and via Ishiki and at Shiyakusho-mae (Kagoshima City Hall) for the bus via Kagoshima Chuo station. 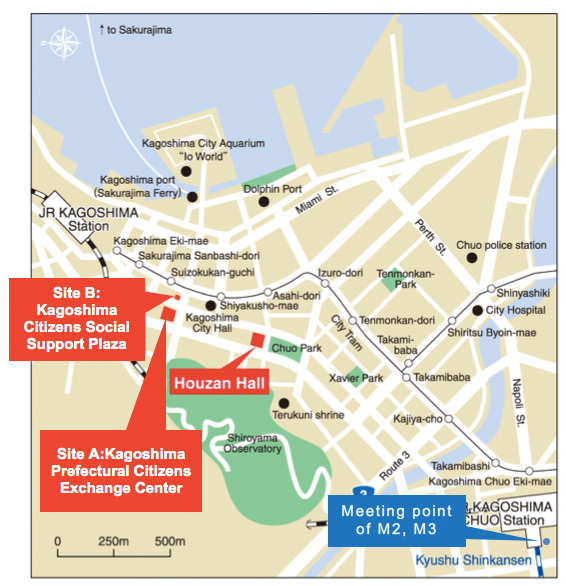 It will be a 10-minute walk to the center from Kinsei-cho and a 5-minute walk from Shiyakusho mae. The bus fare is 1,200 yen for adults and the total travel time will be approximately 60 minutes for the bus via Yoshino and Ishiki and 50 minutes for the bus via Kagoshima Chuo station. Taxi: The travel time is approximately 10 minutes. 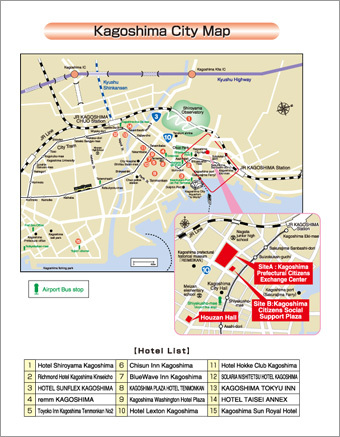 Tram: Take the train from Kagoshima Chuo Station and alight at Asahi-dori, the 7th station, and walk to Houzan Hall. The tram fare is 160 yen for adults. The travel time will be approximately 25 minutes. A 15-minute walk to Houzan Hall. Airport Limousine Bus: Take the bus going to Kagoshima City via Yoshino, via Ishiki or Kagoshima Chuo station. Alight at Kinsei-cho for the bus via Yoshino and Ishiki and at Shiyakusho-mae(Kagoshima City Hall) for the bus via Kagoshima Chuo station. 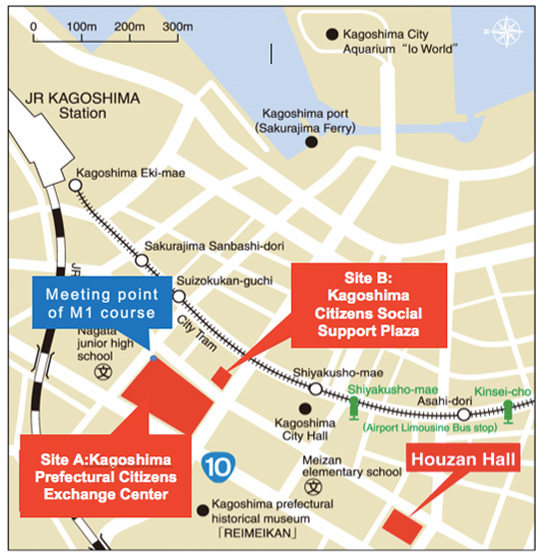 It will be a 5-minute walk to Houzan Hall from Kinsei-cho and Shiyakusho-mae. The total travel time will be about 60 minutes for the bus via Yoshino and via Ishiki and about 50 minutes for the bus via Kagoshima Chuo station. The bus fare is 1,200 yen for adults.